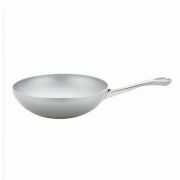 Wok kitchenware products are an invaluable cooking tool for all amateur or professional cooks. 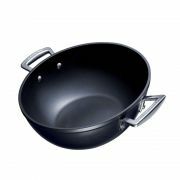 Woks are traditionally used for Chinese cooking, yet thanks to their incredible heat distribution techniques, wok cookware has been employed for other cooking methods as well. 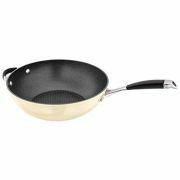 Very little oil is required to use a wok; this ensures healthy cooking plus you will be saving money on cooking supplies to boot. 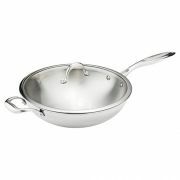 When you begin cooking with your wok, the first step is to season it or oil it if its not a non stick wok. Cast iron woks need to develop a patina to eventually become non stick. Stir frying – The classic way of creating a meal in a wok. This delivers a rich, smoky flavour that is quick to prepare and always pleases the taste buds. 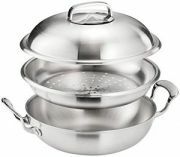 Steaming – By combining a bamboo steamer and a wok, food can be created with no oil at all. This is one of the healthiest ways of cooking and a great way of steaming fish. Deep frying – Not the healthiest way of cooking, but certainly the tastiest. Food develops a crunchy texture and a golden brown coating that ensures a delicious appeal to the taste buds. 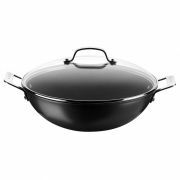 The wok options at ShopCookware range from economical models that more than meet the mettle for any cook, all the way to top of the range Le Creuset wok sets with their cast-iron design and extremely efficient heat distribution. For the cook who is looking to begin their induction into the world of wok-style cooking, the Ken Hom five piece wok set is the ideal option for you. 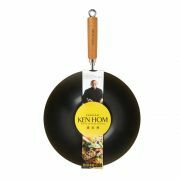 The Ken Hom Wok set comes with all the tools you need to produce Asian food with all the flair of a professional. An instruction booklet is included, letting you experiment and develop food that suits your style. Woks are an incredible way of creating delicious food in minutes or less. Throw all of your ingredients into one massive bowl, add the flavours of your choice; stir it around and voila! Choose the Wok set of your choice and begin cooking up a storm!